A beautiful Lacus image from the Hisashi Hirai artbook. Please don't upload any of my scans elsewhere, kthnx. do you mind if I use your scan to do a wallpaper? OMG! I totally love this pic of Lacus..! Oh I really do like it! thank you so much for sharing this pic here in MT! Nice scan, i am imediatly going to DL it. oh i really love this scan! FAV! Still plenty of Gundam Seed pics I see. Aww! What a lovely Lacus! I had never saw this before! She looks so pensive and pretty. Wow! Her hair looks awesome here! Finally! Someone has this scan! Thank you! There's only One Lacus! (Repeats it over and over!) 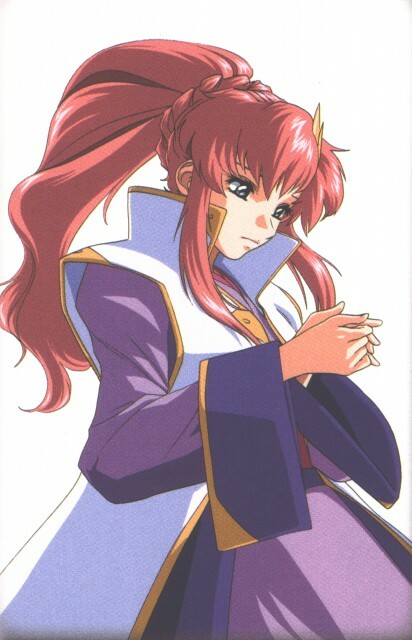 Hope you love my soccer termology, and great scan of Lacus! It's the book with the yellow/brown cover, right? Or is there another book? I'm planning to get the illustration works one next week, but I'm snagging this picture, since I only have a small, poor quality one. :D;; Thanks for scanning this! Quote by aestalitzIt's the book with the yellow/brown cover, right? Or is there another book? I'm planning to get the illustration works one next week, but I'm snagging this picture, since I only have a small, poor quality one. :D;; Thanks for scanning this! thanks for this picture of lacus...looks so serious!